The 2017 Honda CR-V is really about good things getting better. It’s one of America’s best-selling SUVs, with lots of features and performance attributes to match. 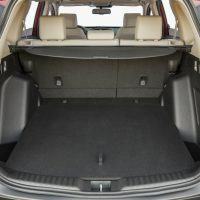 Now in its fifth generation, the 2017 Honda CR-V has more cargo space, new interior refinements, and increased levels of connectivity and comfort. 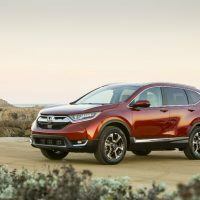 The CR-V’s new body architecture provides benefits as well, from ride and handling to steering response. Nearly 4 million CR-Vs have been sold in the United States over the last 20 years. If you are considering one, here is a breakdown of the 2017 Honda CR-V. The focus was a more aggressive stance, characterized by the combined appearances of the front end, fenders, and headlights. Honda also wanted to achieve a sophisticated and athletic presence, as seen in things like the longer wheel base and short rear overhang. Honda even took the hood into consideration and the dual exhaust is a nice touch too. 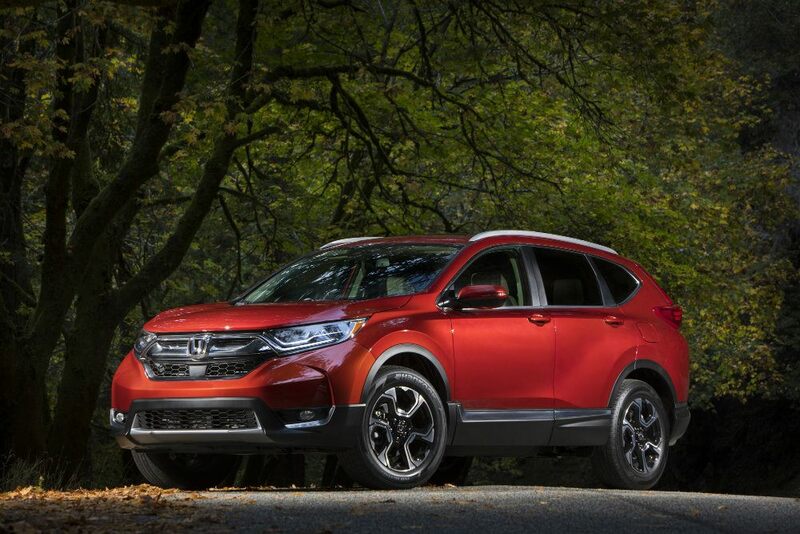 Although, the 2017 Honda CR-V is more than a pretty face – it’s functional and efficient. With the automaker’s first Active Shutter Grille system, aerodynamic drag is reduced to increase fuel efficiency. The A-pillars are narrower to increase visibility. At the rear, the tailgate will open and close by simply waving your foot under the vehicle (optional). 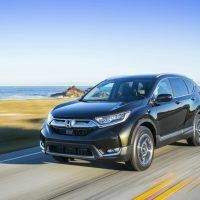 Honda wanted to set a new standard here as they focused on refinement, utility, and premium features. The new soft-touch instrument panel, seat stitching, and color TFT driver information interface are prime examples. Other creature comforts include a remote start, dual-zone climate controls, heated side mirrors, and dual rear USB charging ports. 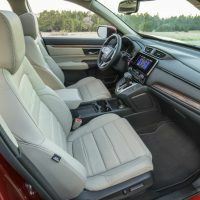 In the way of comfort, the front passenger seat has a 4-way power adjustment while the driver’s seat has an 8-way power adjustment and 4-way power lumbar support. 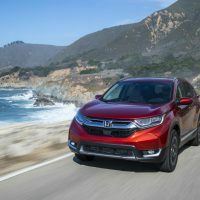 The 2017 Honda CR-V is well connected with a 7-inch touchscreen Display Audio interface. 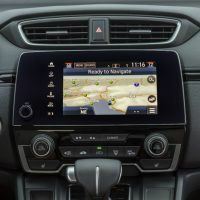 The Android operating system has an available Honda Satellite-Linked Navigation System, developed in partnership with Garmin. Smartphones are easily integrated through Apple CarPlay and Android Auto. 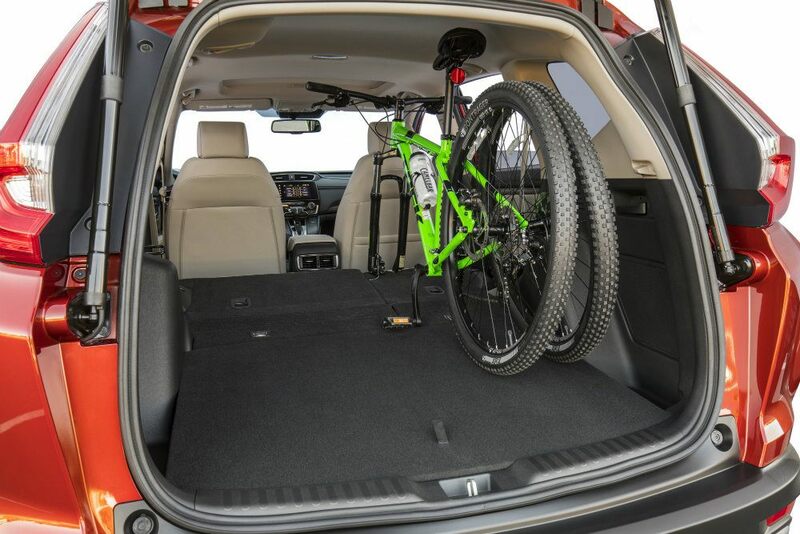 There is plenty of room for everything from groceries and pets to people and sports equipment. Since the 2017 Honda CR-V has a winder stance and longer wheelbase, interior room has increased nicely. 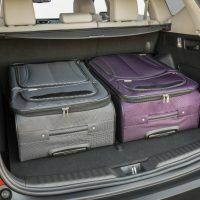 When compared to the previous model, total interior volume is up 1.8 cubic feet. 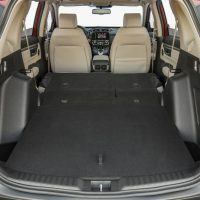 This includes an increase in rear seat legroom by 2.1 inches, while total cargo length, with the second-row seats folded flat, increased by 9.8 inches. 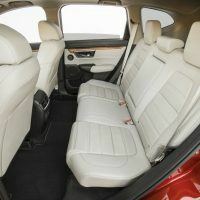 A new 60/40 split rear seat design should make it easy to get passengers and cargo in and out. 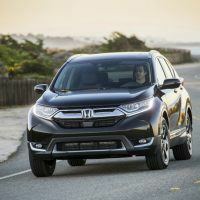 Honda invested a significant amount of time here, focusing on responsiveness, fuel economy, and overall performance. 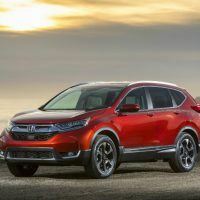 The 2017 Honda CR-V offers two engines, both of which are pretty solid. 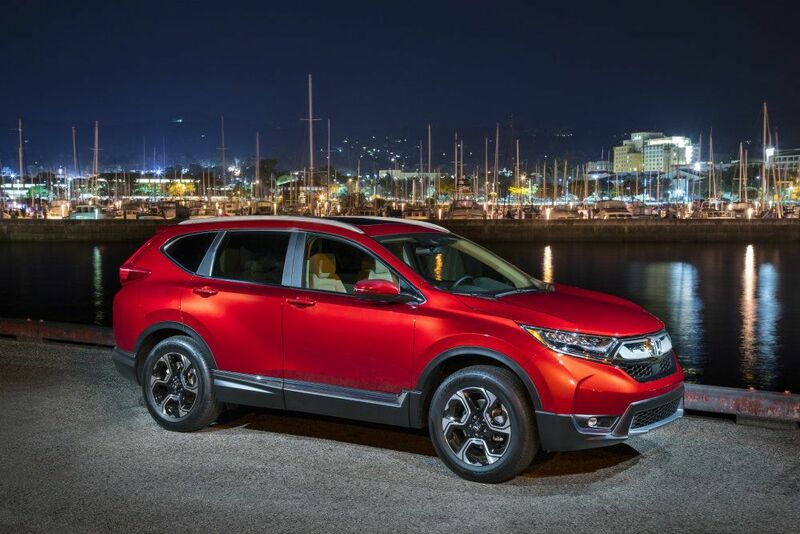 The CR-V LX trims are powered by a 2.4-liter DOHC direct-injected i-VTEC engine with Variable Timing Control. 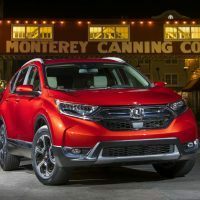 The higher trims feature CR-V’s first turbocharged engine, a 1.5-liter DOHC, Direct-Injected in-line 4-cylinder with dual Valve Timing Control. 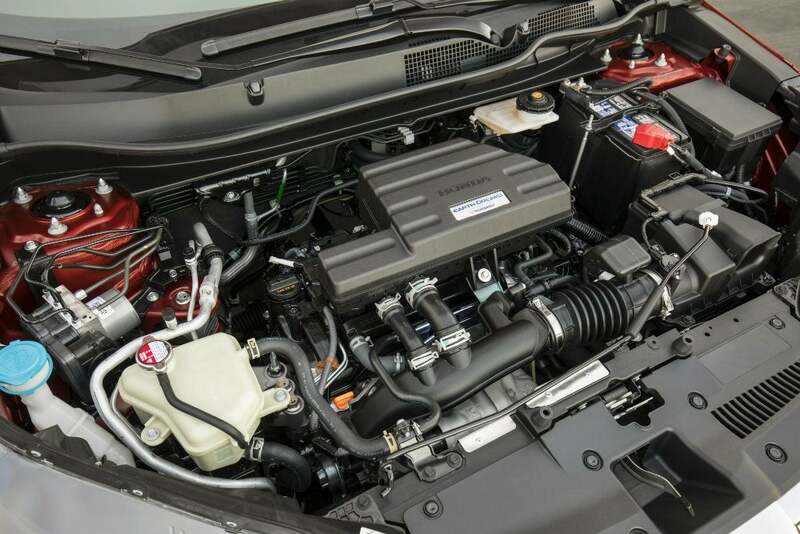 The first engine, the 2.4-liter, creates 184 horsepower and 180 lb-ft. of torque. Fuel economy is EPA rated at 26/32 city/highway and 27 combined with front-wheel drive. All-wheel drive, by comparison, is rated at 25/31 city/highway and 27 combined. 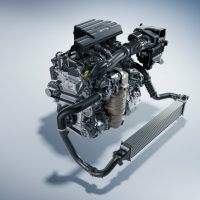 The second engine, the 1.5-liter turbo, comes in at 190 horsepower and 179 lb-ft. of torque. At first glance, the numbers seem pretty close (and they are) but the advantage for the second engine is where the torque is available: 2,000 to 5,000 rpm here as opposed to 3,900 rpm with the 2.4-liter. Fuel economy ratings on the turbo engine are a bit better too: 28/34 city/highway and 30 combined with front-wheel drive and 27/33 city/highway and 29 with all-wheel drive. Try not to stress too much here. 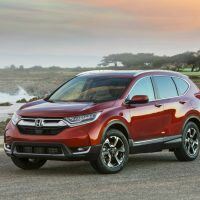 If you are looking at the 2017 Honda CR-V seriously, pick the one that fits your budget. Either engine will be satisfactory. Both are paired to a continuously variable transmission (CVT) with Honda G-Shift control logic. Last big item here is Honda’s Real Time AWD system, which will provide additional footing in bad weather. 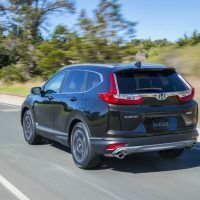 The 2017 Honda CR-V sees a significant increase, through this system, in maximum rear-wheel torque output. 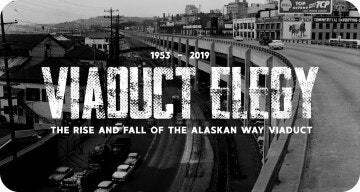 Finally, new electronic controls will provide better traction, regardless of the weather. To increase things like handling and ground clearance, a front MacPherson strut and a new rear multi-link suspension were employed. There are specially tuned low-friction dampers, while tubular front and solid rear stabilizer bars provide more response when turning and driving through corners. The dual-pinion, variable ratio Electric Power Steering is essential here too, providing the driver with a strong sense of control. This will make maneuvering the vehicle through packed city streets, congested parking lots, or rush hour traffic relatively easy. One of the things we feel quite strongly about is Honda’s next-generation Advanced Compatibility Engineering (ACE) body structure. We are convinced it is one of the best designs on the market to keep you and your family safe. 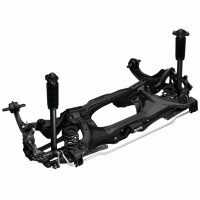 Essentially, ACE is a very strong, very stable front frame structure that provides protection in a frontal collision. 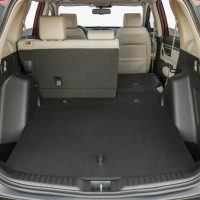 The design disperses crash energy away from occupants (you and your family) by diverting that energy to upper and lower structural elements of the vehicle. 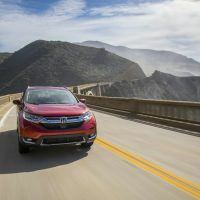 The 2017 Honda CR-V is targeting the highest available safety ratings, including an NCAP 5-star Overall Vehicle Score from the NHTSA and a TOP SAFETY PICK+ rating from the IIHS, including a SUPERIOR rating for frontal crash prevention when equipped with Honda Sensing. 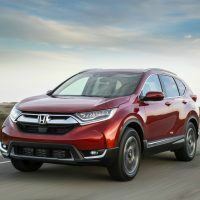 Honda offices in the United States and Japan worked together when developing the 2017 CR-V. The vehicle will be produced in North America at three different facilities: East Liberty, Ohio, Alliston, Ontario, Canada, and, for the first time, Greensburg, Indiana. 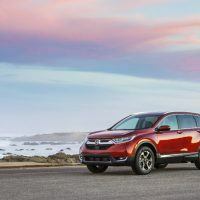 Engines for the new CR-V will be manufactured in Anna, Ohio and in Alliston, Ontario, while the CVT will be produced in Russells Point, Ohio. 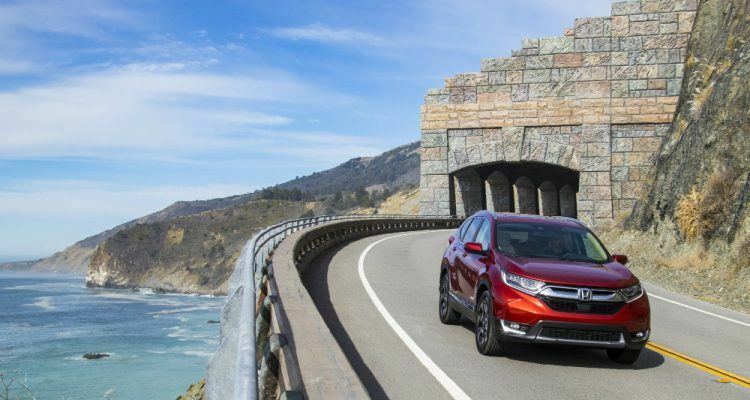 In essence, the 2017 Honda CR-V came to fruition through the collective efforts of the automaker’s various teams worldwide. The vehicle is on sale now with a starting MSRP of $24,045 USD. 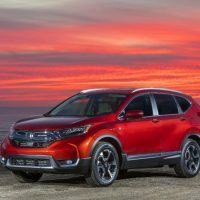 1 Comment on "2017 Honda CR-V: Product & Performance Overview"